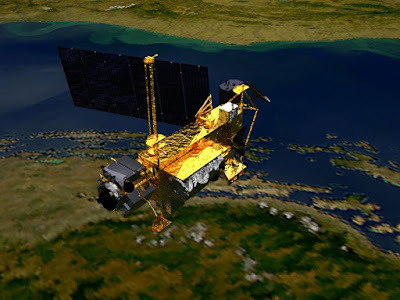 NASA's UARS satellite is now predicted to fall back to the earth during this afternoon or evening of (Eastern Daylight Time) according to a NASA orbital update which was released September 22, 2011 at 9:30 p.m.
As of 9:30 p.m. EDT on Sept. 22, 2011, the orbit of UARS was 110 mi by 115 mi (205 km by 225 km). It is still too early to predict the exact time and location of re-entry. But NASA predicts that it will not hit North America because the satellite will not be overhead during that time period. The re-entry of UARS has advanced because of a sharp increase in solar activity the during last two weeks. Increased solar activity heats up the earth's atmosphere, sending more atmospheric molecules further into space which causes additional drag on low orbital satellites. However, heavily populated areas of the earth (except North and South America) could potentially experience falling debris. FEMA has made preparations just in case UARS falls on the United States.